For beginners to dog training and retriever hunting tests, the jargon can be confusing, with common words taking on new meanings, or the same word use to mean two very different things, depending on the context. This is not all inclusive, and you may find other definitions of some terms, but this will get you started. For technical definitions related to hunting tests, consult the rules and guidelines booklet put out by the national sanctioning organiza­tion, Hunting Retriever Club, Inc./UKC. ANGLE ENTRY- The path to/from retrieve involves dog entering water (or cover) at an angle. The finer angles tend to be more difficult to get the dog to do. 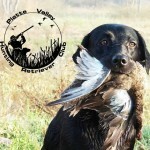 AREA BLIND- On a blind retrieve, handler knows only the general area where a bird is located. AREA OF FALL- Approximate area where bird landed. A good marking dog should stay in this area on a hard mark. BACK-TO-BACK SINGLES- Dog is sent for one marked retrieve, then after retrieving it, is faced a different direction and a second single mark is thrown and retrieved. BASEBALL- A pattern drill used to teach lining and casting for blind retrieves. BIRD STEWARD- Person at a hunting test who is in charge of the birds. BLANK (POPPER)- A cartridge that does not contain bullet or shot. Used for the shotgun report in training and tests. Good gun safety still required. Ear protection recommended. BLIND- 1. Blind retrieve. 2. Duck blind 3. Holding blind. BLIND RETRIEVE- The dog is sent to retrieve a bird that it did not see fall. The dog is expected to take hand, voice and whistle signals to direct it to the bird. BLIND TAPE- Fluorescent orange plastic surveyors tape used to mark location of bird planted as blind retrieve. Dogs are not supposed to be able to see this color. BLINK- Dog goes to the bird or dummy, ignores it and leaves area. BREAK- Dog leaves assigned spot (usually at handler’s heel) without command when bird is thrown, shot, falls or is flushed. CAST- 1.) To direct the dog left, right, back or in by hand­/voice/whistle signals. Usually with respect to a blind retrieve. 2.) To send the dog from the line for a retrieve- either a mark or a blind. CHANNEL BLIND- A blind retrieve where a dog is required to go up the middle of a narrow body of water or stream, staying in the water. Not typically seen in hunting tests. CHEAT- Dog takes the easy way. May not enter water at an angle, takes a shortcut, avoids cover, etc. COLD HONOR- Dog comes to the line and is immediately required to sit quietly while another dog completes retrieve(s). More common is an honor after the dog works. Cold honor tends to be harder for the dog as they expect action when they come to the line. A full working honor requires a dog to remain on line during the entire time of the next dog’s retrieves. CONTROLLED BREAK- Dog leaves to retrieve before being sent, but stops on the handler’s command before going very far. In hunting tests, the maximum distance will vary with the judge and test level. CORN COBBING- A drill to teach a dog to stay in the area of a fall on a double and not to switch. See Tom Quinn Book. CREEP- Dog is inching ahead or hopping as bird is thrown, shot, falls, etc. Penalized more severely as the dog moves up in level. DELAYED TRIPLE- Three birds are shot or thrown in total, but one or two are thrown first, then a delay (usually with duck calling) and the additional bird(s) are thrown before any are retrieved. DISTURB THE HUNT- Either the handler or the dog may be guilty. Typically the handler is too noisy, gets out of the designated area, etc. Dog is most apt to disturb the hunt by barking, bouncing around the blind, or covering too much ground outside the area of the fall. DIVERSION- Either a shot or a fall designed to divert the dog’s attention from the task at hand. Diversion birds are usually thrown on the way back from a retrieve, but may be thrown on the way out in Finished tests. When thrown on the way back, dog should not switch birds. DOUBLE- Two birds to retrieve. Could be marks or blinds. DRAG BACK SCENT- As earlier dogs return from a blind retrieve (especially as they exit water) a trail of scent is left that could effect the following dogs. DRY SHOT- A shot fired, but no bird falls. May be as a diversion, or may be used in the seasoned level to indicate a blind retrieve. ENTRY- 1. How the dog enters the water. 2. Form filled out to enter a hunting test. ESTABLISH A HUNT- Dog goes to the area where he thinks the bird fell and begins to hunt in that area. FAIL- In a hunting test, the dog does not perform well enough against the standard to pass the test on that day. Failing could be for overall marginal performance or one major disqualifying fault. FAULTS Major and minor problems in dog performance. Breaking or hard mouth are examples of major faults. Refusing one whistle on a blind retrieve would be a minor fault. FLASH MARKING- Dog takes a quick look at the fall and shifts attention elsewhere. Tends to come when a dog is anticipating a double or triple. Especially apt to happen if dog knows the second or third bird is a shot flyer. Usually hurts dogs marking. FLOPPER- Live bird (typically pigeon with some wing feathers clipped or pulled) which can not fly, but does not have wings restrained. FLUSH- In upland bird hunting, the dog locates the bird while quartering and drives it into the air. FLY AWAY- Bird may be thrown or flushed. May or may not be a shot, but the bird flies away and there is no retrieve. FREEZING- Dog holds onto bird and will not release it. Not necessarily hard mouth. FULL WORKING HONOR- Honor dog will remain on the line and watch the working dog run the complete test. GALLERY- Spectators watching a hunting test. Need to remain in area assigned by judges/mar­shal and be quiet while dog works. Good work may be applauded, after the dog has completed all retrieves and is no longer under judgment. GUN CAPTAIN- Person responsible for official gunners (live gunners and poppers) at a hunting test. GUN- 1. Individual designated as an official gunner at an event. 2. Firearm handler swings and fires (blanks) in seasoned and finished tests. GUNSHY- Dog is afraid of gun. Difficult to cure, easy to prevent. See any decent retriever training book. HAND SIGNAL- Handler’s use of hands/arms to give the dog directions to the location of a bird. HANDLER- Person who is in control of the dog while hunting or in a hunting test. HARD MOUTH- Dog damages bird by chewing in the process of retrieving it. Serious disqualify­ing fault. Definition typically is: Bird rendered unfit for the table. HAZARD- 1. Something that tends to get in the way of a retrieve, such as heavy cover, difficult terrain, angle water entry, tight marks, etc. 2. Something which cold endanger the dog while hunting. HOLDING BLIND- Typically a flat or V-shaped piece of canvas on stakes to block the dog’s view of the upcoming test. May also be a parked car, etc. Next dog to run the test is kept in the holding blind until called to the line. HONOR- Dog to sit quietly off-leash on or near the line while another dog retrieves. INTIMIDATE- Threatening behavior by the handler toward the dog to get or avoid certain behavior from the dog. May be voice or gestures or exposed equipment. Not allowed in hunting tests. LINE- 1. Location from which the dog is sent to retrieve. 2. A straight line to the bird. 3. To “line” a blind is to go directly to a blind retrieve on the initial cast-no whistle or hand signals. MARK- A retrieve that the dog has seen fall. MARSHAL- Person responsible for the mechanics and smooth running of a hunting test. Each level will have it’s own marshal as well to coordinate with judges, call the dogs to the line, etc. MEMORY BIRD- First bird the dog sees thrown/shot on a multiple mark. Usually the last retrieved. NO BIRD- By virtue of something happening that makes it impossible for the judge to judge the dog, a dog is run again later. For example, on a shot live bird, a bird may be missed. See the marshal for when your dog will be re-run. ORDER OF RETRIEVES Typically the dog determines the order of retrieves of multiple marks. The judge may require the handler in advanced level to select the order a mark is retrieved in or require a blind to be retrieved before a mark. In hunting this would be done if the dog needed to retrieve a cripple before the dead bird(s). OUT OF CONTENTION- A dog running in a fun hunt for training purposes. It is not eligible for a ribbon because it will be run without performing all tests or run in a way not allowed by the normal rules (Example and unsteady dog running the Seasoned marks while on a leash). OVER- Verbal command to send the dog left or right when handling. OVER & UNDER- A double mark where the two birds fall on a straight line from the dog, one further back than the other. PASS- 1. Dog performs up to the standards expected in a hunting test. 2. In upland hunting, a dog is said to pass a bird, when the dog misses a bird which is then flushed by the handler (or other) following the dog. PIGGY DOG- Dog which performs very slowly and with no spirit or interest at all. May be a dog with no hunt or may have been created by poor training. POINTS- Passes in Licensed HRC hunts can earn points toward the Hunting Retriever Champion Title. POISON BIRD- The bird which must be left alone by the dog while they retrieve another bird first. Typically the poison bird will be up close, a shot flyer, etc. A test of control. POP- 1. to fire a blank (popper). 2. Dog stops on its own and looks to handler for directions. PREMIUM LIST- Entry form for a hunting test or field trial. QUARTERING- Dog works back and forth in front of the handler/hunter searching likely cover using nose to locate upland game. RECAST- In lower level tests, it may be OK for handler to call the dog in and re­-send on a retrieve. RERUN- A dog runs the same test again, because of a problem that does not allow the dog to be judged. RUN ORDER- In a hunting test, the dogs to run are drawn in random order to run. Marshal may need to alter run order to achieve smooth progress of the hunt. See marshal if you are running dogs in more than one location. SELECTION OF BIRD- Handler tells dog which bird to retrieve first. May be at option of handler, or in the order judge instructs. SHACKLED BIRD- A bird (typically a duck) which has wings and feet tied so it can not fly or swim away before being retrieved. SERIES- A complete hunting test may (for example) require four single retrieves. If the two land retrieves are done as back-to-back singles, then the test moves to a new location for the water tests. The first two retrieves would be termed, the first series. SINGLE- One bird to retrieve. Compared to doubles, triples, etc. SLUICED BIRD- In hunting, a crippled bird which is shot on the water. May be simulated in a hunting test by a second shot at or very near the bird in the water. Makes marking more difficult, and can be a real breaking test if bird is nearby. SPLASH WATER (RUNNING WATER)- Water that is shallow enough that the dog can wade rather than swim. STEADY TO WING AND SHOT- In upland hunting, a dog should be trained to sit when a bird is flushed, or when there is a shot nearby. STEADY- Dog does not leave assigned spot until instructed by the handler to retrieve. STYLE- How the dog looks while it is doing its job. There are individual and breed differences. SWITCH- Dog drops one bird and retrieves another. TEST DOG- Dog run at the beginning of each hunting test to show the handlers what the test is. TRACKING- 1.) A tracking test, where the dog uses the noise to follow and find a bird. 2.) The handler swinging to follow the bird with shotgun, popping at the top of the arc. WALK-UP- Bird is thrown while handler and dog are walking with the dog at heel, much like jump shooting.